Are you wondering how much wedding cake you will need or how many cupcakes is enough for your big day? Worried you won’t have enough or you’ll have way too much cake left over? Let me help. I know how hard it is trying to determine how many servings is the right amount for any catering or entertaining so let me help make it easier. Consider how many wedding invitations you sent, how many RSVPs you received and if you have an open bar or cash bar. All of these items will help you determine the right amount of servings. Typically, a wedding with an open bar will see less guests enjoying the cake and more dancing the night away. If you have a cash bar, the serving amount will be closer to the number that RSVP’d. 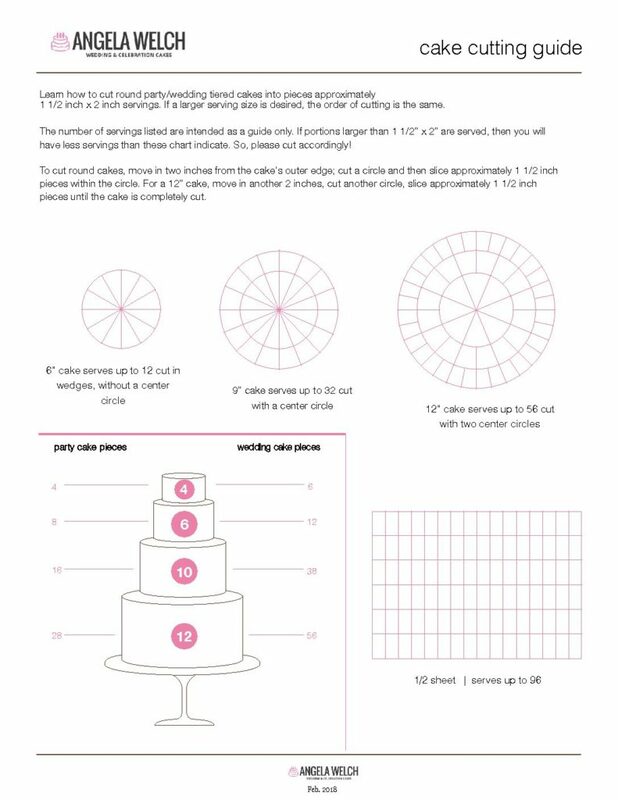 Needless to say, this cheat sheet below is a safe bet on just how much cake you will need to ensure you have enough for your big day. To get your own copy of my cake cutting guide, click the download link to the right.